It is the opinion of this blog (me) that organizing and activism could be a lot funnier. And I don’t just mean witty slogans, with creative plays on words — I mean laugh-out-loud funny. Maybe it’s the influence of being married to a comedian, but as I’ve argued in a prior post, comedy has long been a subversive medium, and it is highly under-utilized in working for progressive change. That’s why I’m excited by the work of the Yes Men and their more recently formed Yes Lab, through which they are sharing their skills and knowledge with the broader activist community. 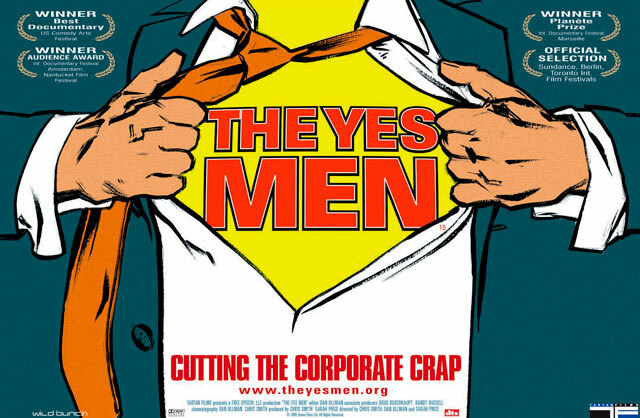 The Yes Men are Igor Vamos and Jacques Servin (or, more recently, Andy Bichlbaum and Mike Bonanno), two white men who have become famous for impersonating corporate executives, and subverting mass media in order to uncover lies and abuses perpetuated by international corporations. They began their “laughtivism” career in 1999, during the Seattle anti-globalization protests, when they created a fake World Trade Organization website satirizing the international group. Since then, they have posed as executives from Exxon Mobil, a Canadian environmental minister, and campaigners for Bush and Cheney. They have put out a fake paper edition of the New York Times and as corporate businessmen have been selling “Survivaballs,” live-in body suits to protect people from global warming. They’ve put out two movies that document their antics, the most recent one being The Yes Men Fix the World.